Will Sanders' Gun Record Haunt Him in the Democratic Primary? 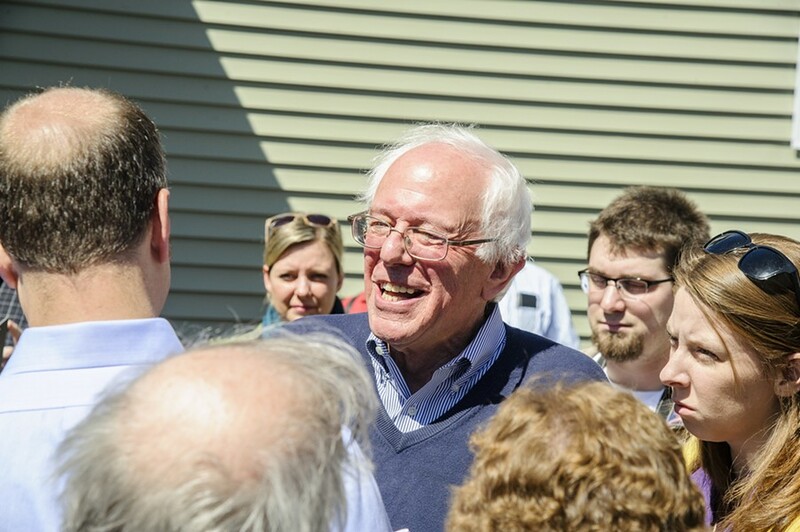 Sen. Bernie Sanders at a New Hampshire house party in April. Ever since the National Rifle Association helped elect him to Congress in 1990, Sen. Bernie Sanders (I-Vt.) has always had a complicated relationship with guns. In the early 1990s, he opposed the Brady Bill, which mandated criminal background checks for gun buyers, but he supported a federal ban on assault weapons. After a gunman opened fire on a Colorado movie theater in July 2012, killing 12 and injuring 70, Sanders told the Addison County Independent that "decisions about gun control should be made as close to home as possible — at the state level." But after another gunman killed 20 children and six adults at Connecticut's Sandy Hook Elementary School five months later, he voted for sweeping federal legislation to mandate background checks and ban the sale of assault weapons. In some respects, Sanders' evolving position on gun laws mirrors that of his Vermont constituents, who used to vociferously oppose gun control but now appear more open to it. But among the Democratic voters he's courting in his run for president, many of Sanders' past positions seem to be out of the mainstream. In a national poll conducted by Quinnipiac University last July, 80 percent of Democratic voters surveyed said they supported "stricter gun control laws," while only 17 percent opposed them. Ninety-eight percent of Democrats favored the background checks he once opposed. Following Wednesday night's deadly shooting of nine parishioners at a historically black Charleston, S.C. church, the issue is bound to come up in the presidential debate. While Sanders has run as a progressive alternative to former secretary of state Hillary Clinton, his record on firearms puts him well to the right of both Clinton and former Maryland governor Martin O'Malley, both of whom have consistently supported gun control measures. South Carolina plays host to the second presidential primary election, and Sanders was scheduled to visit Charleston on Sunday. On Thursday afternoon, a day after the shooting, he postponed the trip and asked supporters to donate to the Emanuel African Methodist Episcopal Church. "The Charleston church killings are a tragic reminder of the ugly stain of racism that still taints our nation," he said in a statement. "This senseless violence fills me with outrage, disgust and a deep, deep sadness." Despite Wednesday's shooting, Sanders isn't likely to raise the issue of gun laws on his own. For two and a half months after the December 2012 Sandy Hook shooting, the senator ignored or declined Seven Days' repeated requests for an interview on the subject. During that period, on January 16, 2013, Sanders issued a press release intimating he would back President Barack Obama's proposal to ban assault weapons and require universal background checks. “As someone who, in 1994, voted for a ban on military-style assault weapons, I am certainly prepared to do that again," he said in a written statement. "As the president proposed, I think it’s also important that Congress take a very hard look at developing the best ways to keep guns and high-capacity ammunition magazines out of the hands of people who should not have them." In the end, when the Senate voted on a version of the proposal on April 17, Sanders supported universal background checks and bans on assault weapons and high-capacity ammunition. "Nobody believes that gun control by itself is going to end the horrors we have seen in Newtown, Conn., Aurora, Colo., Blacksburg, Va., Tucson, Ariz., and other American communities," he said in a statement. "There is a growing consensus, however, in Vermont and across America that we have got to do as much as we can to end the cold-blooded, mass murders of innocent people." Will Sanders' position continue to evolve after the latest shooting? His spokesman did not immediately respond to questions on the matter.